Oh how a year changes things. Kentucky is well represented in the 1st round. Butler was the heart of WVU, and he now goes to the city where Butler University plays ball. Coincidence??? Yes. With the 2010 NBA Draft just 2 weeks away, I give you my updated NBA Mock Draft 2.0. A lot has changed since my first mock draft: NBA Draft Combine was held, team scheduled workouts are underway, and player evaluations have improved. For the past two weeks, I’ve been staying up on my research of the top prospects: from their completed workouts, interested teams, to all the rumors. From everything I’ve compiled through the web, daily newspapers, magazines, and of course my own sources here’s how I feel this year’s NBA Draft will shakedown if the draft were to be held tomorrow. Enjoy! 1. Wizards- This pick is going nowhere, John Wall will be a Washington Wizard next season, I can assure you that. 2. 76ers- As I mentioned in my mock draft, the 76ers aren’t 100% certain they’ll hold onto this pick. There’s definitely a possibility that the #2 pick could be sent away if I the trading partner is willing to take on Elton Brand and his long-term contract. Unless Brand is included in a deal, I see Philly keeping the pick, don’t see them involving Iguodala unless they’ll receive a high 1st round pick in return. 3. Nets- There has been some outside interest from around the league regarding their 3rd pick in this year’s draft but as of now don’t expect any deals involving the pick to happen. 4. Minnesota Timberwolves- Minnesota is all but satisfied with this pick and are exploring their options on moving up as well as out of the draft with their fourth pick. With two other first round picks in this year’s draft, I wouldn’t be surprised to see them get rid of the 4th pick if the right deal was on the table. The fourth pick is definitely available to all teams, if the price is right. If they don’t move the pick, I now see the Timberwolves selecting DeMarcus Cousins here at #3. Many would scratch their head to where exactly he fits in, but let’s not forget the Wolves kept surprising us last year, stocking up with point guards in each of their three first-round picks. They shipped off one of them in Ty Lawson and I see the selection of Cousins allowing them to ship off either Kevin Love or Al Jefferson (the more likely to be moved). 5. Sacramento Kings- Each year it seems like nobody has a clue what the Kings organization has up their sleeve on draft night and once again the NBA world is kept pondering their options here. What I can tell you is that the Sacramento Kings have no interest in trading this pick. The question that remains unknown is whether or not they’d select Greg Monroe over DeMarcus Cousins. While Cousins is regarded as the player with most potential, Monroe is the safe pick who reminds Sac-Town of a young Chris Webber. I see Sacramento not rolling any dice and taking the safe pick with Monroe. 6. Golden State Warriors- If Wesley Johnson falls to the Warriors here at #6, there’s no chance they’ll pass him up. But I’m going to throw you a Oakland-like Zito curve ball to ponder, could the Phoenix Suns do a sign-and-trade Amare Stoudemire to Golden State in exchange for Wesley Johnson. No truth behind this happening, but I like the proposition. Amare gets his max contract with a good fit in Golden State, while the Suns get a nice piece to move towards the future with, just saying. 7. Detroit Pistons- While the Pistons have been reportedly aggressively trying to move up into the 4-5 range, I just don’t see it happening unless they strike a deal with the Minnesota Timberwolves. I wouldn’t have the slightest idea what the Pistons would be willing to offer and what the Timberwolves would be willing to accept but I’d say Rodney Stuckey and/or Tayshaun Prince would be included in any deal. If Detroit doesn’t deal, expect them to take Al-Farouq Aminu. He’s a young, up and coming small forward that allows them to continue to shop Tayshaun Prince who they’re more than willing to get off their hands. 8. Los Angeles Clippers-Lots of hype around the Web say the Clippers are hot on Gordon Haywood and that isn’t a surprise to me. He’s versatile, he’s a winner, and could pan out to be a great pick, even here as high as eight. I find their interest in Hayward comical because I see a lot of Mike Dunleavy in Gordon Hayward as an NBA prospect. Hayward will definitely be mentioned inside the Clippers draft room when on the clock but in the end I see them passing on him and going with Xavier Henry instead. 9. Utah Jazz- ESPN’s Chad Ford wrote that the Utah Jazz have been high on Luke Babbit longer than most and they’ve continue to remain high on his potential. But do I really see them using their 9th pick on Babbit? Absolutely not, maybe this is just my own bias here, being that I’m not high on Babbitt as a top ten pick, but I see the Jazz going power forward. They know they’re losing Carlos Boozer this summer so why not go with a power forward with high potential to back-up the new starting power forward in Utah, Paul Millsap? I see Jerry Sloan and the Utah Jazz taking none other than Ed Davis as big with a high potential and basketball intellect. 10. Indiana Pacers- Maybe the scenario is too perfect but if Gordon Hayward is still on the board, we all know the talk will be how in the world could Indiana pass up on him? I see them buying into the idea of selecting him for a variety of reasons. Not only will he help sell seats and be a great fit building toward the future, but it gives the Pacers the ability to unload Danny Granger. I remain high on the idea that the Timberwolves will strike out in snagging restricted free agent Rudy Gay and will elect to trade for Danny Granger. Pacers then get either Kevin Love or Al Jefferson in return which replaces departing free agent Troy Murphy (after next year) and they’re future finally gets on the right track. 11. New Orleans Hornets- The Hornets could go any direction outside of drafting a point guard at the eleventh position. But of all their immediate needs, I see them selecting a center with this pick. With Okafor everything but impressive in his first season with the Hornets, it’d be wise that they take the opportunity to draft a big man to develop. If there was a time to do it, the time is now. This year’s draft at pick #11 offers a variety of attractive centers that could potentially blossom into stars. The three top candidates for this pick if they decide to look inside would be Cole Aldrich, Hassan Whiteside, and Daniel Orton. Though it’s pretty clear that Aldrich is the most NBA-ready center to step right in to contribute I see the Hornets drafting on overall potential and athleticism. With that being said, I see New Orleans taking Hassan Whiteside, a prospect often compared to Tyson Chandler type player around the basket. Last time I checked, Chris Paul played pretty well with the real Tyson Chandler, maybe Whiteside can tandem to do much of the same down the road. But there is some definite concern, it has been reported that Hassan Whiteside and Daniel Orton both got schooled recently by Rockets center (& former Hornet draftee) Hilton Armstrong, take it for what it’s worth. I know that hearing that kind of concerns me, but I’m still a buyer on Whiteside’s potential. 12. Memphis Grizzlies- I don’t hear much drift out of the Memphis Grizzlies camp but credible sources around the league have said that the Grizzlies are set on selecting Luke Babbitt if he happens to fall into their hands at twelve. Personally, I don’t like the pick nor Babbitt as an NBA prospect, but this is the same team that drafted Hasheem Thabeet 2nd overall last year. How is he not a perfect fit in Toronto if he falls to them at #13? Can he play for the Maple Leafs too? 13. Toronto Raptors- With Chris Bosh departing, drafting a power forward is a must for the Toronto Raptors this year. Or do they? Last year Toronto signed their former first pick Andrea Bargnani to a 5 year, $50 million dollar extension. 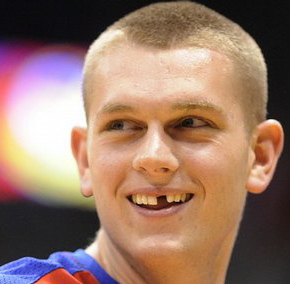 If Cole Aldrich is still on the board, I see them picking him in a heartbeat; they’d not only select the most NBA-ready talent, but add toughness at the center position. This selection is also key in allowing Bargnani to move over to the starting power forward position. Obviously losing Bosh will be a huge loss, but having the ability to take Aldrich with the 13th pick should help Raptor fans restore some sort of optimism looking towards the future. 14. Houston Rockets- Even after acquiring Jordan Hill near the deadline last season, the Rockets need to invest in drafting another power forward to turn too next year. I see their man being Ekpe Udoh at #14. Udoh bring the long, defensive minded power forward they’d love to have down low. Never underestimate Rockets GM Darryl Morey and his “numbers” system, Udoh might solve his math problem with what to do at the 14th pick. 15. Milwaukee Bucks- If all goes as planned in this mock draft, the Bucks are left scratching their heads on what to do here with this pick. All of their favorite prospects have been taken, not one of them has slid down to them at the midway point of the draft. Even I, as someone who covers the Milwaukee Bucks am left confused on what to do here with Ed Davis, Hassan Whiteside, and Xavier Henry off the board. So I see them taking the best available player which at this point is easily Paul George. While George is labeled a small forward, I think the Bucks would experiment with placing George at the shooting guard position since it’s such a slight change as far as the Milwaukee Bucks offense is concerned. George could very well end up being a blessing in disguise for the Brew City, could it be two straight years of successful draft picks for the Milwaukee Bucks?! We’ll have to wait and see…. One of the most hyped up draft picks in recent history, John Wall has a lot challenges awaiting him in D.C., but behind the luck of Mr. Abe Polin’s championship ring Wall is everything the Wizards organization could ever ask for. Skills aside, his marketability alone will help change the face and image of the Wizards’ franchise as it moves forward from their past nightmare of a season. While I feel as though, Wall maybe a little overhyped, my only concern with his development are those influences around him. Being so young is great, but the Wizards must keep a close eye out on Wall, keeping him on his steady path towards being successful. Wall in Washington offers a variety of challenges on and off the basketball court, hopefully he can keep a level head, stay smart, and can continually grow as a professional. With Gilbert Arenas and Josh Howard on board, the smartest thing the Wizards could do is go grab a long-time veteran point guard that can lead Wall by example. A great example of this can be seen with the Chicago Bulls going out and grabbing Lindsay Hunter when the Bulls drafted Derrick Rose, a player Wall is often compared too. It’ll be interesting to see what shakes down next season in Philly. Turner very well could be the key to the 76ers being able to make some trades. Many are already pondering whether or not Turner and Andre Iguodala can coexist together. While I think they can definitely work together I wouldn’t be surprised to see Philly keeping Iguodala out on the trading block. One team that really stands out as a possible trading partner would be the Memphis Grizzlies. If the Grizzlies are unable to resign Rudy Gay, they may be interested in acquiring Iguodala, a player so similar to Gay that it wouldn’t be a completely change in offensive strategies next year in Memphis. The 76ers can’t go wrong with drafting Turner, from his overall potential to the decisions he immediately allows the franchise to make, this great situation for both Turner and the 76ers. So what if the New Jersey Nets weren’t rewarded with the first overall pick for their horrendous play last season, this very well could be a blessing in disguise. Drafting Derrick Favors is the best fit for New Jersey anyways. Drafting Wall would’ve led to having to make a tough decision on Devin Harris’s future with the franchise, Favors on the other hand, helps them avoid the unneeded headache. He’ll compliment Brook Lopez very well and gives them a drastic improvement at the power forward position. For Favors there’s not a better situation available, if all goes as planned he should be a starter from jump. He’ll be given plenty of minutes and will have the chance to gain valuable exposure and experience; Nets fans should be looking forward to the progression he’ll make immediately. Looking down the road, I like Yi Jianlian being my sixth man off the bench, a foreigner whose not always consistent but should be much better off not having to deal with as much expectations. Derrick will do both the Nets and Yi a big Favor (pun intended) even as a rookie. With the Timberwolves under the leadership of General Manager David Kahn, you never quite know what to expect on draft night as we all found out this past year. Despite what many mock drafts around the Web suggest, I’m not so sure the Timberwolves take Johnson here. 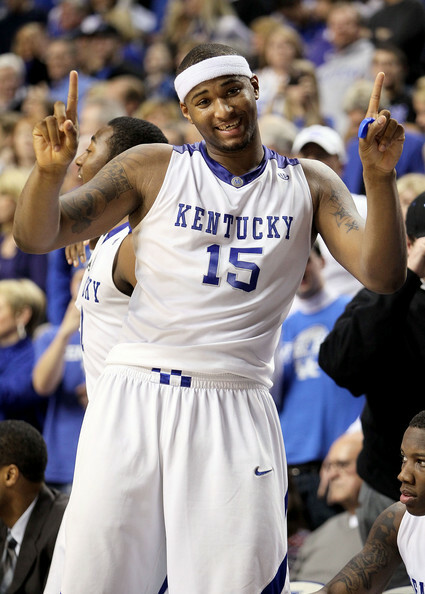 Even before NBA draft workouts, my gut tells me not to count out the Timberwolves selecting DeMarcus Cousins. Whether or not Kahn decides to pull the trigger on Cousins depends on how patient he’s willing to be. Earlier this past season, the Timberwolves and Pacers came extremely close on deal that would’ve sent Al Jefferson to Indiana in exchange for Danny Granger. Cousins is often compared to Al Jefferson in terms of size and abilities. It’s not out of the question that Kahn selects Cousins, then attempts to pull the deal for Granger offering up Al Jefferson and Corey Brewer. This trade would immediately improve both teams, the only road block that may stand in the way is Pacers forward Troy Murphy. But for the Timberwolves, adding Cousins and Granger instantaneously makes them no laughing matter next season. Don’t forget that the sooner the Timberwolves become successful, the sooner Ricky Rubio may decide it’s time make the move over to the join the team. But that’s a lot of speculation on my part and until the draft talk continues to heat up I’ll stand pat with the majority of mock drafts and take Wesley Johnson here at number four. The last thing the Sacramento Kings need is another young big man, but unfortunately for them, the best players availiable are in face big men. Sac-Town will choose between taking DeMarcus Cousins or Greg Monroe here at five. With the Maloof brothers all to familiar with gambling owning their luxurious Palms hotel in Las Vegas, I got to say they’ll go with Cousins. His definitely the risky selection but I see his overall potential too hard to pass up. As Jason Thompson continues to develop, it doesn’t make a whole lot of sense to take Greg Monroe here, even when he’s by far the safest pick. You cannot have Thompson coming off your bench, especially now that they have sixth man of the year candidate Carl Landry after the trade with Houston. If Cousins can live up to his potential, stay in shape, and improve his game the it’s scary to envision what Sacramento’s future may have in store with the combination of Tyreke Evans and DeMarcus Cousins. Monroe has arguably has the highest basketball IQ out of all the projected lottery picks. After snagging the very intelligent basketball player in Stephen Curry in last year’s draft, it makes perfect sense to put Monroe alongside their future point guard. The two would work very well together, having too very young and wise talents inside and outside. If Anthony Randolph can bounce back from injury, the Warriors future big three can consist of Curry, Randolph, and Monroe. The Pistons desperately need a big man and Cole Adrich is the next best option left on the board once Cousins and Monroe are off the board. A good shot blocker, Aldrich can continue to help Detroit basketball have a strong defensive presence down low. This year the Pistons went with Ben Wallace as their starting center and Big Ben has just never been the same since deciding to leave Detroit to sign with Chicago a few years back. Aldrich is Mo-Town’s new future at the center position. 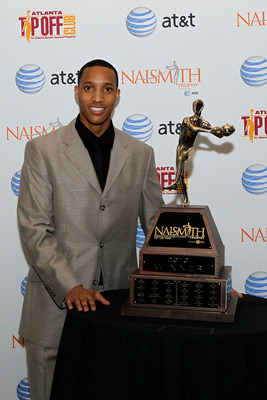 With the likely departure of Carlos Boozer, Patterson would be a nice addition to the Jazz young core group of guys. The Jazz main concern will be his ability to knock down the open mid-range jump shots that are very important in the two-man game with Deron Williams. But Patterson’s lack of a NBA ready jumpshot should be the least of Utah’s concerns, he posses a lot of intangibles you just can’t teach. He has soft hands and even more importantly a high basketball IQ, something that will go a long way with Head Coach Jerry Sloan. While Xavier Henry most likely is the best player availiable on the board, they Pacers don’t need another shooting guard, they need somebody to fill the void at the point guard position. Bradley isn’t close to ready to handle the starting duties, but can be immediate spark plug the Pacers are missing. One of the worst defensive teams in the NBA, Avery won’t help them improve in that department but in the NBA if you cannot play defense, you can always try to out score opponents. Avery has a knack for putting the ball in the basket and can contribute some points off the bench. The New Orleans Hornets had a very successful draft night last year, adding Darren Collison and Marcus Thornton both whom raised eyebrows throughout the league with their rookie season performances. Henry is a deadly shooter who can do all the things Morris Peterson isn’t able to do anymore. This young prospect has the size and strength to play both the shooting guard and the small forward position which is extremely valuable to the Hornets. Next season they’ll look to play point guards Paul and Collison at the same time and being able to place Henry in that small forward can help both of the Hornets’ penetrating point guards tally up some assists with his perimeter game. The issue isn’t whether or not Rudy Gay decides to stay because George will be a work in progress throughout his entire rookie season. But his upside is worthy of being selected at number 12. He’s long, athletic, and has a quick release on his shot. If selected by the Grizzlies, he may find a few spots minutes to prove his rookie worth but don’t expect to see him out on the floor much more than Suns fans saw Earl Clark this season. With Chris Bosh leaving soon, the Raptors definitely need to add a big man here. Though Ed Davis and Ekpe Udoh remain on the board, I see Bryan Colangelo intrigued by the Motiejunas who has all the potential to make him a steal at pick 13. Always the biggest concern with young international players is whether or not they’ll be able to fully transition their games to the NBA style of play. In Toronto, Motiejunas has best chance to transition his game moderately fast with a team consisting of many international sensations with the likes of Jose Calderon, Hedo Turkoglu, Marco Belinelli, and Andrea Bargnani (the player Motiejunas is often compared to). Unfortunately it looks as though my favorite draft prospect won’t be available when it comes time for the Milwaukee Bucks to be on the clock. The Houston Rockets would get a steal here if Whiteside happens to fall into their laps at 14. I start salivating just hearing the comparisons of Whiteside being a young, raw talent that is comparable to Marcus Camby. He would be a good fit in Houston due in large part that he won’t be expected to contribute much his rookie season. So if you’re an NBA fan looking to catch a glimpse of Whiteside, get to the game when the gates open up one and half hours before game time, you can be sure he’ll be putting in a lot of work in pregame workouts. If Whiteside pans out to be just 70% of the player he has the potential to become, this selection will be well worth it. While I’d love to see Bucks General Manager John Hammond and the Bucks attempt to trade up for the rights to Hassan Whiteside, I see them ultimately sticking with their pick here at 15. That pick is looking like it’ll be Ed Davis, the power forward out of North Carolina. My favorite description of Davis can be seen on NBADraft.net where these words fall under his strengths section: “live” legs, high motor, excellent touch, and tremendous footwork for his age. Then one last description on Davis drops louder than a bomb in the eyes of anybody who understand the Milwaukee Bucks team mentality: He “does not have a superstar attitude, he has a workman’s approach to the game that is refreshing to see.” The Bucks will love every bit of that characteristic, the thought of developing two gym rats in Brandon Jennings at point and Ed Davis down low could definitely be something to look forward to in the future. Udoh can help add to the Timberwolves strength down low. He’s a tremendous shot blocker and should end being more of a defensive minded player in the NBA. Udoh could learn a lot practicing with Kevin Love and Al Jefferson on a daily basis. Could end up being of the better steals in the draft if he does slide past the lottery picks. Anderson brings the outside shooting presence that the Bulls lacked all season long from the perimeter. Don’t sleep on the Big 12 player of the year who averaged 22.3 points last season, he offers a lot of upside, and would fit in nicely in Chicago. Considering that Heat only have five players under contract next season, the possibilities at this pick are endless. The Heat’s hope is to sign a big name PF/C and hope to also persuade Dwyane Wade to remain with them as well. So I’d see the Heat looking to add a small forward with high energy. Big 12 Conference’s all time leading rebounder fits the profile and is one of the more athletically gifted talents available in this draft. The Heat wouldn’t go wrong with taking James here at 18, even when many NBA analysts may find this a little too high for James. Who knows how many more seasons Kevin Garnett’s knees can handle. Sanders is a very late bloomer who never played organized basketball until the 10th grade. A very strong defensive player, Sanders could learn a lot from of the best defensive power forwards in the business in Garnett. He has a lot of room for growth and could end becoming a very solid player in this league. Though I must say it’s hard picturing Hayward in a Spurs uniform, I think he’d be a nice pick here at 20 for the Spurs. He provide a little bit of everything and could potentially be a huge boost of the Spurs bench. With Richard Jefferson, all but impressive after his first year with the Spurs, Hayward might find a fair amount of time to play. If I’m Gregg Popovich, I love having to young talents in Hayward and DeJuan Blair to turn too off the bench. We’ll just have to wait and see how Babbitt’s future pans out in the NBA but if it’s anything like it’s projected to be, the Thunder have find another great piece that fits with their future. Babbitt at 6’9 is a lethal shooter with the ability to play both the small forward and power forward positions. For his own sake, he better prepare to play the power forward position with Kevin Durant occupying the majoring of the small forward minutes. Realistically, if Babbit lands in Oklahoma City I see him being a bonafide sixth man that could potentially be a sixth man award candidate down the road. It’d be silly for Portland to even consider any prospect outside of the power forward and center positions. With their luck with injuries, they could always improve their support system down in the paint. The popular options here are Solomon Alabi and Daniel Orton, but I see Blazers General Manager Kevin Pritchard taking his chances on Kevin Seraphin, the young product out of France. Already having Nicolas Batum on board, Seraphin would have French companion to help aid his adjustment to the NBA if the Blazers decide to bring him over to play next season. Seraphin’s upside is worth the gamble as the first round gets into it’s later selections. Once again you must pop the question, do you go best player available or do you go immediate needs? I see the Timberwolves opting against taking the best player available (either Orton or Alabi) and rather choosing a shooting guard. Heading into the NBA Draft Combine I would’ve put Elliot Williams ahead of Lance Stephenson in my rankings, but after missing the NBA Draft Combine due to injury, Stephenson jumps him in my book. It was very costly time to get injured and allowing teams to get a look at you in the pivotal pre-draft camp is so important for anyone’s draft stock. But in the long term, Stephenson is the more promising player of the two shooting guards, he’s got an NBA ready body who’s a guy that needed one more year of college to fully blossom. Depending on what happens during free agency, Stephenson may have a outside chance of starting next season for the Timberwolves if they’re willing to endure another long losing season. The Hawks have so many questions left unanswered at the shooting guard position, what will all pan out with Joe Johnson? Nobody has the slightest idea but the chances of Atlanta holding onto him looks all but promising. With that being said, they need to look at drafting a shooting guard with this pick. I see Sixth Man of the Year Jamal Crawford becoming the Hawks starting shooting guard next season so he’ll need a backup. Warren has an NBA ready body and has the offensive skills to be a highly productive scorer in the future. He’s a very interesting prospect who was listed as a lottery pick in many mock drafts before last season. Both Orton and his agent will finally be relieved to know he’ll be coming off the board in the first round after being a guy who fell way past where he’s currently projected to be drafted (in the high teens). This is a great pickup by the Grizzlies here with the 25th pick and Orton hopefully can develop his game having to defend Zach Randolph each day in practice. Not very well known, Johnson could very well be a big sleeper in this year’s draft class. He’s quick and crafty which could be the perfect player to back up Russell Westbrook. While Eric Maynor will still find his own opportunities to find minutes at the backup point guard slot, Johnson will give him a run for his money next season. His size alone is very intriguing, but he’s a work in progress. If the Nets are willing to gamble, stay patient then this is a wise pick with Alabi being one of the best available here at 27. If not, expect the Nets to go get a better-known college player like Devin Ebanks. He was very much hidden behind the play of John Wall last season with Kentucky and I definitely feel Bledsoe may be one the this year’s best keep late first round secrets. He’s very athletic and has the strength that allows him to absorb contact while finishing around the rim. Nice backup to Mike Conley next season and he could potentially take over Conley’s starting job in the coming years. This highly explosive young shooting guard needs to improve his perimeter shooting, but has the leaping ability you just can’t teach. A year under the wing of Vince Carter could really benefit Williams during his rookie season and it’s worth the Magic taking him here this late in the first round. 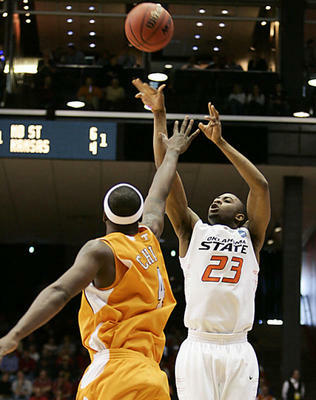 Much like Eric Bledsoe, Lawal was hidden behind Derrick Favors this past year at Georgia Tech. While still raw, Lawal has a lot of potential to become solid down the road. Wizards need some help in the frontcourt and Lawal is the best available. Last time we went over the top 25, but NCAA basketball’s excitement does not come from the powerhouses, it is the small schools, the bubble teams and the little engines that can. So by that logic, this column should be some of the best of NCAA basketball because it is about those teams, right? We will see. We Are Marquette. Too bad this guy can't help. What up Golden Eagles? Yeah, I am a bit of a homer to write about my home school, but they are squarely on the bubble with a chance to hurt someone if they make the tournament. Lazar Hayward is still underappreciated, Jimmy Butler has come on strong, Darius Johnson-Odom (DJO) has been an impact player from the start. They may lack a real big man, but they do an outstanding job rebounding the basketball and play tough with well above-average athleticism. I like their chances to make the tournament (naturally, being a student), but they cannot afford to drop games too early in the Big East Tournament or losses to the likes of Seton Hall, St. John’s, Cincinnati, or Notre Dame. Losing to Marquette was big, but the Bulls have a heartbeat. They will probably have to win a couple games in the Big East Tournament to really be in safely, but there is little doubt in my mind that they are one of the 65 best teams in the country. They cannot afford to slip up much more if they want to keep their bubble in tact. A road win over Villanova would do wonders for their chances, obviously. The owners of the nation’s longest winning streak show no signs of letting up on their way to March Madness. Sadly for the Bears, they will likely end up a 15 seed (according to Lord of All Things Bracket, Joe Lunardi), but that does not mean that their brand of ball is not worth watching. They may not be a George Mason candidate, but they are a very solid team and if they ever make it on TV before the tournament (less than likely), keep an eye on them. Would you believe they were a 9 seed if I told you that right now? I didn’t think so, but again Lord of Brackets Joe Lunardi has them there, and they really are not a fluke. They are tied for first in the Colonial, and have played a lot of good teams very close when they did lose. We will know A LOT more after they play Northern Iowa this week. Do not be surprised if you hear more from the Monarchs this March. Unruly fans aside, the bulldogs just played the #2 team in the country damn well and did so without their #1 scorer. The fans were clearly out of line and they should be punished somehow, but they are a pretty good basketball team right not and you would rather not face shot-blocking menace Jarvis Varnado and the Bulldogs. They live and die by the 3, and that is very dangerous come tournament time. Catch them on the wrong day and you will be catching a flight back to campus. The 2nd place team in the ACC has a lot of work to do if they would like to stay off the bubble, but it looks like work they are capable of doing. They have 3 lock tournament teams left on their schedule in Duke, GT, and Maryland and if they can win 2 they are in with ease. If they only win 1, then they will need to make a run in the ACC tournament. I have a bad feeling for Seth Greenberg’s men that on Selection Sunday, they will be left without a partner for the big dance. Six teams for the A-10?!?!?! It is looking more and more like it every day. We all know about Xavier being a perennial tournament team, but for those of you who have not been watching, Richmond is slated for a 7 seed, Dayton is slated for a 10 seed, Rhode Island is slated for a 10 seed, Temple for a 5 seed, and Charlotte is on the bubble, but in. None of them is a title contender really, but all of them have a shot at knocking off a big team in the second round. However, I do have some suspicions about the conference. Often when we see a conference like this that is suddenly getting a lot of teams in it either turns out that many of them are studs, or all of them are a bit over-inflated. I feel like Temple and Richmond are the most likely to make the sweet 16, but I would not get too crazy on the A-10 when filling out your bracket. Lord Lunardi says they are in right now, but I would not jump to any conclusions about them. I do not have any reason for thinking this, as I have not seen them this season, but I would bet on them flopping in the Big XII Tournament. Once you take away James Anderson, an absolute stud, they do not have a ton, so I would not be too confident picking them. We do not need another 63 teams or whatever number people want to add. If it ain’t broke, fix it anyway? The first is not a good idea. See, this works in theory, but when you start getting so many teams there will be fewer games that are thought of as upsets. When you get two mediocre teams in the same building, the only upset things are the fans watching who are not fans of either team. The problem with the second one is that it is just a weak excuse. I mean I guess it is technically true, but this whole reform process is supposed to make the tournament (a basketball tournament, not a business tournament) a more compelling and better event. The only thing the second item does is lines the coffers of NCAA brass. The last one is pretty self-explanatory. March Madness is the single best postseason tournament in sports, so why are we trying to change it? It is just about perfect as it is. Not to mention, if they expand the field, then every single one of the teams discussed above will be in the tournament without any suspense, making this article very difficult to write. Please and thank you. Want to stay up to date with what is going on in the circus that is the sports world? Click below to stay informed with OTC! Subscribe to the OuttaTownClowns Blog!